I often jokingly refer to my job as being a “rocket scientist.” While it does involve rockets and space, it isn’t nearly as “down in the numbers” as the jobs portrayed in this film were. I’ve worked with a lot of people over the years in this technical field, and my opinion has always been that, if somebody is competent enough to do the job, we should hire the most competent people to do said job. Even though this is a statement against nepotism and just knowing the right people in the right places, what this film has shown me is that it’s not nearly that simple. In terms of competency, I will not judge you by your gender or your race, as long as you show you can do the work and not be a burden on the team. However, even though people are highly qualified, they have had the deck stacked against them from the very start. What Hidden Figures reveals is the barriers to even be considered for a job, even if the competence is there. These three women all had incredible talent, but the mere bureaucracy put in place to prevent them from succeeding was appalling. Not only do I feel we should be judged by the competence of our work, but I also feel everyone should be given the same opportunities to prove they can do said work. Even despite these barriers, these three women stood up against the system put in place against them. From challenging the law in order to attend needed classes to stealing a book from the library to get a jump start on “the next big thing,” I can only hope that these barriers do not exist today in part due to their exemplary efforts. The actual space program felt ancillary to these stories, which was probably why its part of the film didn’t have the same emotional impact that it did in films like The Right Stuff (1983) and Apollo 13 (1995). Still, the humor and levity present throughout this film perhaps made the racism and sexism just a little less impactful, even if it made the film overall more enjoyable (and not a browbeater). 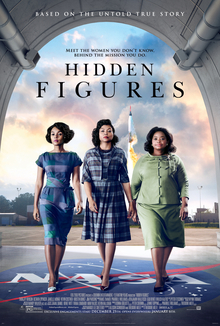 A fantastic film about the lesser-known geniuses of the NASA space program, I give Hidden Figures 4.0 stars out of 5.